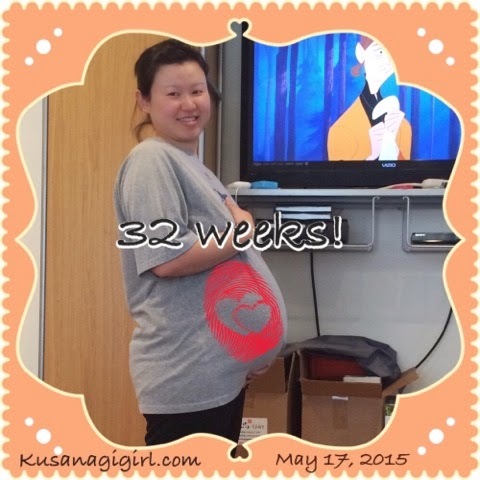 KusanagiGirl: 32 weeks! 8 weeks left! Last night we got out Jellybean's infant car seat and got it ready for Baby #2. I'm telling you seeing it all set up brought back memories of Jellybean as a newborn as well as making the upcoming arrival of Baby #2 seem a lot more real! I'm carrying out 2nd daughter a lot lower than I did with Jellybean. Baby #2 is already head down and her crown is right on my bladder. So the torture of drinking liquids is that I have to go to the bathroom almost every 30 minutes. I've been getting contractions every day yet at my last checkup I'm still good (not dilated or effaced). So the waiting game continues!